Handmade gifts that have been made by the kids are the best! 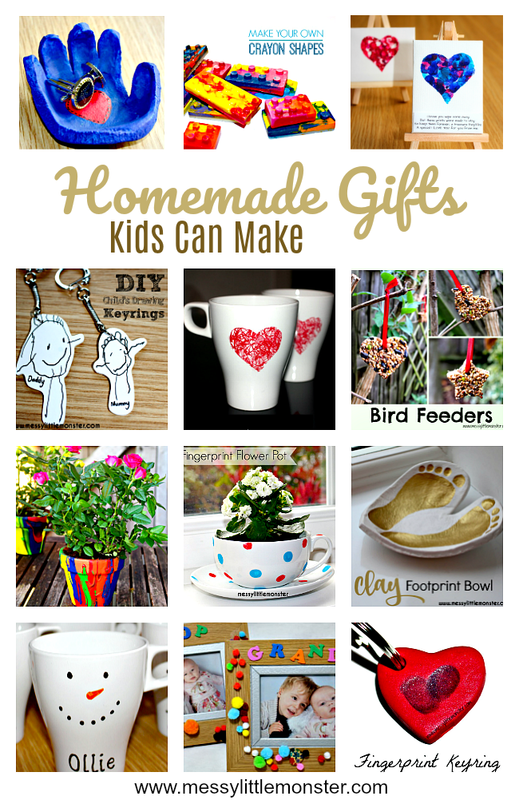 Here is a collection of easy handmade gifts kids can make, lots of the ideas are easy enough handmade gift ideas for toddlers and preschoolers to make. Family and friends would be delighted to receive a thoughtful homemade gift at Christmas, for Mothers Day or a birthday, especially grandparents and mums and dads! 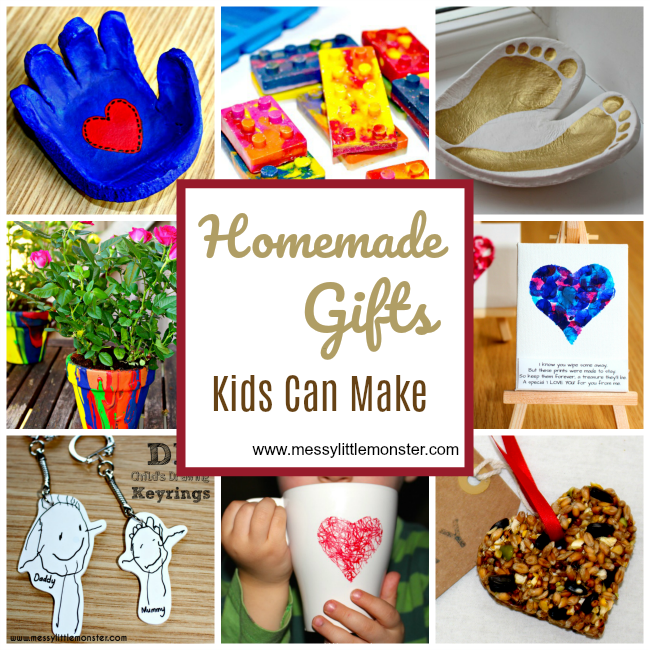 We love homemade gifts and keepsake and have a whole list of keepsake craft ideas that kids can make as well as those included in the list below. Do take a look as some of them are adorable! Children have lots of fun making handmade gifts and it is lovely to see how delighted people are when they receive them. Its a great way of teaching children the importance of kindness and of giving, especially at Christmas time. If you are looking for handmade gift ideas for Christmas you could also make and give out one of these adorable DIY Christmas ornaments. Scroll through all the handmade gift ideas below and click on the links to be taken to full instructions and photographs of the homemade gifts. Once you have decided on which handmade gift to make you might want to make your own gift wrap. Follow the simple instructions to make a homemade bird feeder. These look great as gifts, especially if you add ribbon and a homemade gift tag to them. These DIY crayons are perfect for children to make as gifts for friends and to receive themselves. Its a good way to recycle old broken crayons too! This is the perfect handmade gift idea for toddlers and preschoolers! They can make really effective looking mugs with this simple technique. We love the heart design, but you could do any shape your toddler or preschooler chooses! Another DIY mug, this time for older children. Copy the simple snowman design and add a name to personalise it. These colourful flower pots are so much fun to make. They look really effective once they are dry and children can choose their own plant to go inside them. Or alternatively make a fingerprint flower pot. These heart shaped clay bowls are really easy to make using air dry clay and they look amazing. Personally I love the addition of little footprints inside these bowls, but they would look equally as amazing without. I love this so much and I'm sure any mum or grandma would too! This beautiful butterfly clay bowl is made using your baby or toddlers tiny footprints and it looks ADORABLE as well as being the perfect place to keep your rings. If you love the footprint keepsake bowls you will love these handprint bowls made from salt dough. This handmade gift can be made from just a few supplies that your probably already have at home! Sugar scrubs are suprisingly easy to make and if you put them in a glass jar they can look beautiful. Do you remember shrinky dinks? Make keyrings using your child's drawings to make a really personal handmade gift for family, friends or a teacher. Using a child's fingerprint create a beautiful keyring using polymer clay. This is a perfect handmade gift to make with younger children who are too small to make a gift themselves. You could also use salt dough and turn them into fingerprint heart magnets. These tiny canvases on easels are adorable for any artwork. Add fingerprints and a poem as we did or use them to draw a special picture. Drawing a portrait of the person you are sending the gift to can be a nice touch. Toddlers and preschoolers could also make really simple art on a larger canvas. I love the pens used on these canvases. Water pistol painting is also a really fun and effective way of making a canvas. Decorating a frame and then adding a favourite photograph inside it is a lovely gift for a family member. Tell someone how much you love them by baking them some heart shaped cookies! This is the perfect homemade gift for food lovers. This set of coasters are perfect for a real life 'superhero' in your child's life. Use foam to make a cute heart shaped bag. It would be lovely to make a heart bag to fill with other homemade gifts. 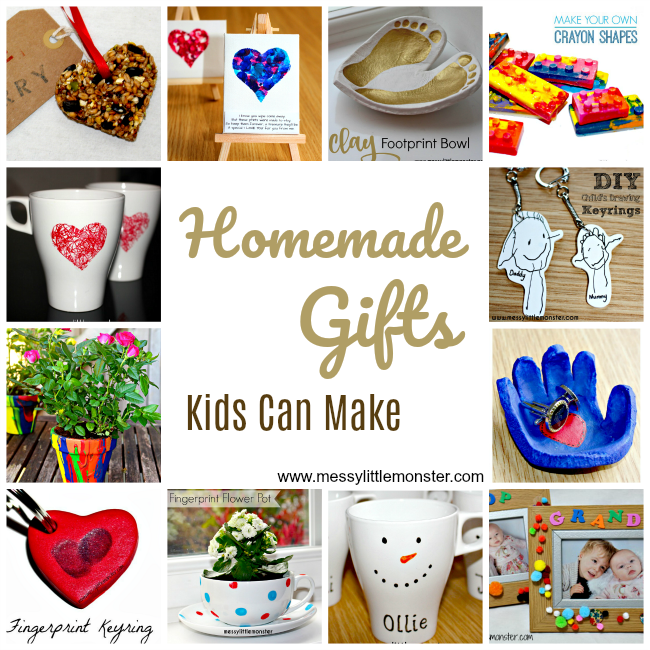 Hopefully within this handmade gift list you have found a few handmade gift ideas to make with the kids? Don't forget to make your handmade wrapping paper to add that extra special touch to your homemade gift.